Home / Rusco / Rusco Spin Down Filter PE Screen T Style 2"
Rusco 2" Spin Down Sediment Filter System with Polyester Filter Screen make solid particle removal simple and economical. 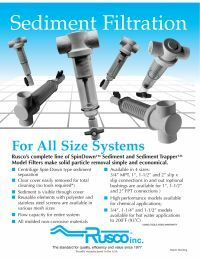 The benefit of the 2" Spin Down filter system is its ability to be cleaned and reused. 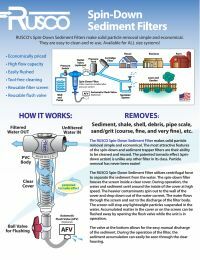 The 2" Spin-Down Sediment Filter by Rusco has a clear cover that can be easily removed for total cleaning. The unique tornado (spin-down action) effect created by the patented process is unique.